No enclosure (cover), reducing installation space and cost effective. 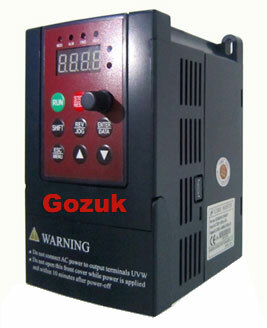 Widely used in All-In-One control cabinet. Keep the same functions as other universal single phase to three phase VFDs. Note: this non-enclosure VFD is 1 phase input, but the output is 3 phase, so it only suitable for 3 phase induction motors. Lots of applications can save money by using variable frequency drive (even if a small one, like 5hp) to better control the speed of the AC motor to the driven machinery. This can result in significant reduce total cost in addition to improved process control, lower maintenance, longer system life, very soft start, improved flexibility, integration into automation systems, lower audible noise and increased performance, then save your money. When input 1 phase power to the variable frequency drive, you need to double the size of the VFD. For example, If you have a 230V, 4.5amp, 3 phase motor and your feeding the VFD with single phase 230V source, the size of the variable frequency drive needs to be 230V, 9.0 Ampere, say a 3HP VFD. When applying 1 phase rating input to the VFD, R & S terminals have to be used. This provides voltage to the transformer that supplies 120 volts to drive blower fan. If these terminals are not used, the drive blower fan will not power up and the VFD over heating situation may occur. Ready to buy? refer to our price list, the direct sale from manufacturer. The most common applications of 1hp VFDs are Fans & Pumps, just like larger horsepower VFDs, it changes the power line input of single phase 60Hz/50Hz into variable frequency to feed the 3 phase motor, thus reducing the 3 phase motor speed and electricity consumption.